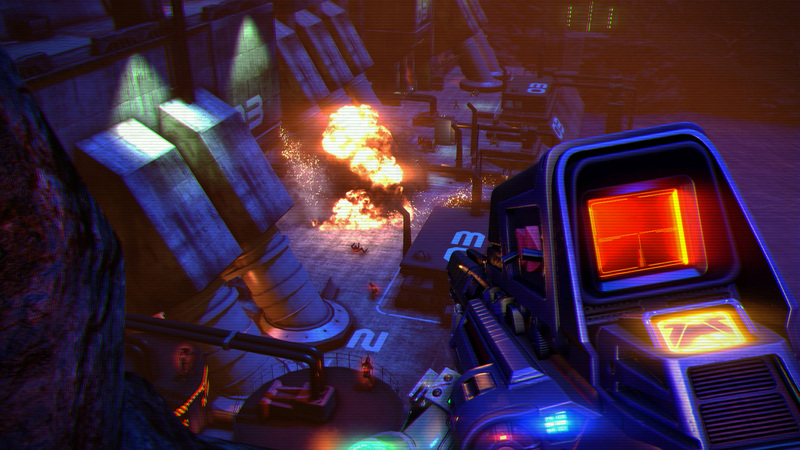 Far Cry 3: Blood Dragon channels the spirit of cheesy '80s sci-fi/action into what is essentially an awesome total conversion mod for Far Cry 3. I’m not sure why a game like Far Cry 3: Blood Dragon exists, but it really doesn’t matter. Under the divisive direction of Clint Hocking, Far Cry 2 gained something of a reputation as a series that was, at least to some degree, willing to mold the trappings of triple-A design into a deeper commentary. It’s a tactic that Far Cry 3’s muddled narrative attempted to repeat while Jason Brody was running around Rook Island, playing at war. Whether or not it was successful is besides the point. Blood Dragon doesn’t care about any of that. If you wanted to, you could read the just-released stand-alone DLC’s neon, synth-soaked, crotch-grabbing aesthetic as a perversely ironic meta-commentary on ‘80s-flavored hipster culture. And you’d be missing the point. 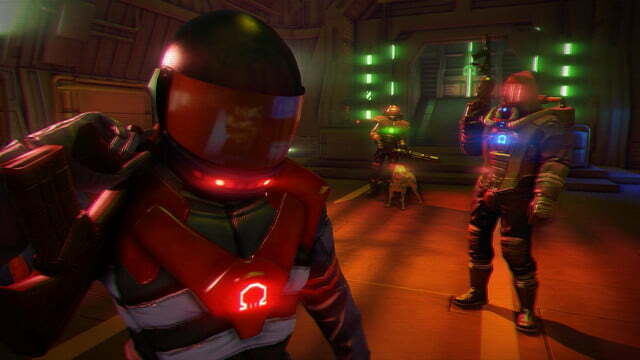 It’s best to just accept Blood Dragon for exactly what it is: ridiculous, hilarious bullsh*t.
Blood Dragon is smarter than it has any right to be. Following an on-rails minigun shootout (accompanied by the gleeful yelps of Little Richard), the Terminator-armed cyber commando sergeant Rex Power Colt is dropped into the game’s tutorial stage, much to his own chagrin. “Jump if you wish to jump,” your HUD cheerfully says – that’s what Rex calls the tutorial voiceover – as an on-screen prompt explains that the jump mechanic allows engagement with the z-axis. “Just let me kill people, damn it,” Rex complains. Blood Dragon has a lacerating sense of humor when it comes to overused industry design trends. “Liberated garrisons are liberated,” one of the sarcastic loading screen hints reads. Of course, the joke is that this is just a stripped down version of Far Cry 3. Whether or not you’ve invested any time with the core game, if you’ve played a first-person shooter in the past five years then you’re not going to have any problems figuring Blood Dragon out. Better still, all of the tedious elements from FC3 have been weeded out. Rex starts off with the game’s full arsenal of chunky ‘80s sci-fi ordnance, all of it outfitted with an electric Tron flourish and effects to match. Even grenades are mercifully plentiful. From the moment you can walk forward (“focusing on slowing down your pace from run to something significantly slower,” according to a tutorial prompt) Blood Dragon’s message is clear: shut up and have some fun. In an era of games with an overabundance of poorly executed gravitas and even worse writing, Blood Dragon‘s self-awareness couples well with a total inability to take itself seriously. This is hard game to play if you’re not willing to wear a stupid grin plastered across your face. “I f***ing hate tutorials, and this one is terrible!” Rex yells after a hilariously long set of text prompts. Kinda says it all, right? Though Rex’s one-liners might suggest otherwise, you quickly learn the lightning-blue cybernetic hearts of your Daft Punk-helmeted foes aren’t just uselessly grotesque ornaments of a good kill. They’re bloody distractions for Blood Dragon’s titular beasts, which are less like the creatures of myth and more like huge, magenta-blooded lizards capable of tearing you limb from limb. Like everything else in this standalone outing, blood dragons are pure visual excess, with an over the top explosive gush of fuschia serving as their death throes. They stomp around the inexplicably tropical wasteland among cybernetic big cats and laser-eyed sharks. In truth, their presence makes about as much sense as anything else you’ll come across here. As it stands, these T-Rex-ish monsters must be avoided by crouching, or more effectively by luring then away with the tasty smell of freshly-harvested cyberhearts. This works to your advantage when you use a heart to sic blood dragons on the occupied garrisons of your Omega Force adversaries. The resulting carnage of is almost as fun as the dragons’ narrative purpose, a would-be tool of a new world order to keep the United States from peace with the Reds. That, and they can muster a latent laser blast from their mouths that’ll make an Omega Force goon explode in a puff of bright viscera. Because why the hell not? Basically, liberating garrisons from Blood Dragon’s angry, red open world landscape is similar to taking over pirate outposts in the original Far Cry 3, but with 1,000 percent more day-glo violence and giant death dinosaurs. Not seeing a problem there. Blood Dragon’s terrible-incredible retro arcade game-styled opening outlines a goofy alternate history post-apocalypse in which the U.S. dropped a nuke on Canada in order to stop a Soviet invasion. This sets a precedent for the game’s sense of stylistic cohesion. Rex’s introduction harks back to The Six Million Dollar Man (or equivalent show actually from the ‘80s), complete with a power performance voiceover (“From the radioactive ashes of North America, a new breed of solider is reborn…”) as the appropriately named Power Glove blares the synth-heavy score. In some ways it is maybe impossible to not acknowledge the influence of Drive and Hotline Miami just from listening to Blood Dragon‘s score. The soundtrack, easily worth the $15 price of of the DLC on its own, does a great job of evoking the feeling that you’re in a low-budget, made-for-TV cyber vision of the future, circa 1986. It’s a feeling echoed throughout the game’s fantastically faux-serious script, most of it coming from Rex voice actor Michael Biehn, doing his best ragged-Nick-Nolte-after-a-bender. 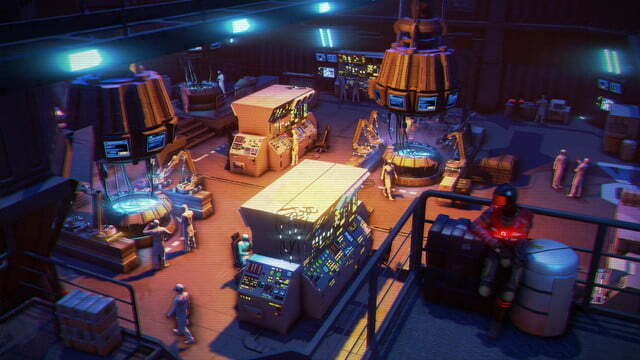 Blood Dragon’s actors universally hit just the right combination of cheese and machismo. When Rex first picks up the game’s non-mounted minigun, he boisterously belts out a horribly off-key rendition of Slayer’s famous guitar riff from “Raining Blood,” and he delights in throwing out Devil horns with his cybernetic hand upon finishing a mission. Similarly, there are too many dumb lines reminiscent of ‘80s cartoons of the era to count. Meanwhile, the world is covered in CRT scan lines that flicker and distort like a lo-fi version of Kane & Lynch 2 when an explosion goes off. 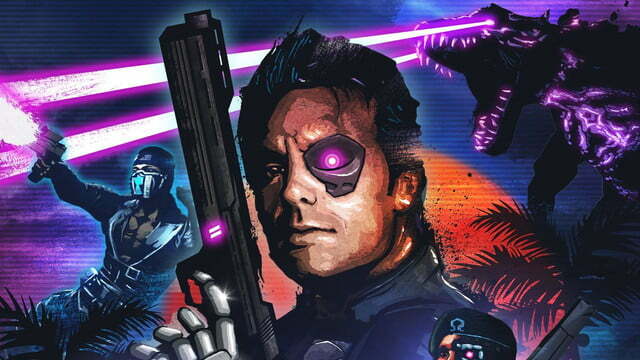 Far Cry 3’s original assets are still recognizable under Blood Dragon’s fresh coat of decidedly old-school paint, but the amount of polish put in to allow it a visual identity all its own is commendable. Even your minimap is a simple black and white grid. Few games really capture the essence of an era as effectively. Under different parameters or execution, Blood Dragon might simply smack too much of novelty. Thankfully, Ubisoft Montreal had the sense to make the game only exactly as long as it needed to be. 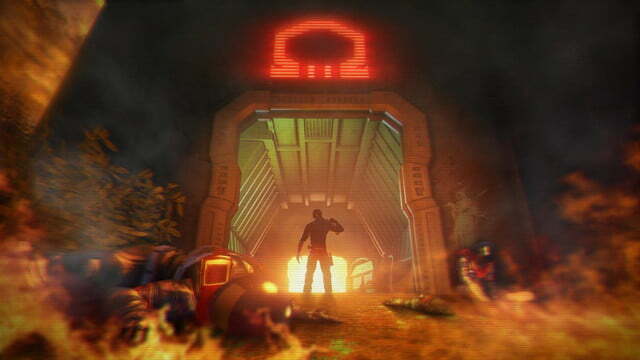 While you can plow through the main campaign in around three hours, die hards that want to play the game like Far Cry proper can probably expect to put in another two or three scouring for collectables, saving hapless scientists, and hunting robo-wildlife (beware the villainous cyber-cassowaries!). At such a short length, the game doesn’t have time to wear out its welcome, and it makes a quality case for smaller games from big publishers. 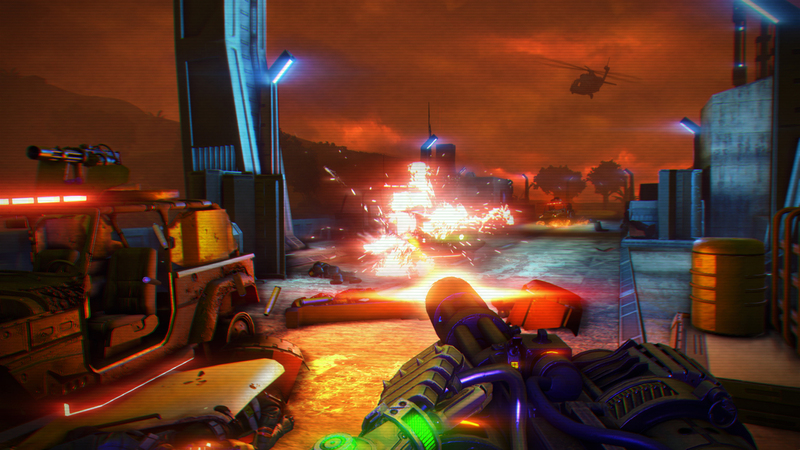 It may only be called Far Cry for its engine usage, but Blood Dragon is maybe what the series’ third installment should have been all along.